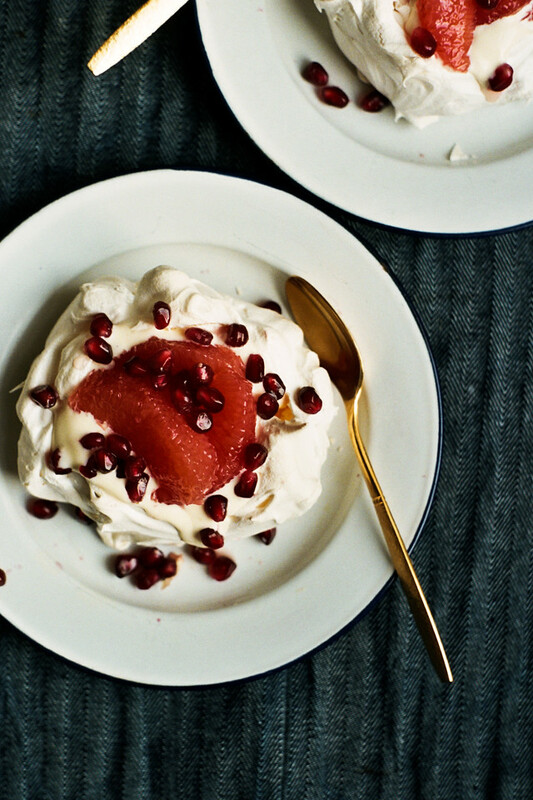 Most folks might associate pavlova with a big pile of summer berries, but they are just as nice with a citrusy kick instead. For this wintery pavlova I topped crisp and chewy pillows of meringue with Tartine Bakery's perfect lemon cream which is a sweet, tart, and buttery-rich riff on lemon curd. The whole thing is adorned with juicy slices of pink grapefruit and tart pomegranate arils. Llight and refreshing to the max. - If you love meyer lemons and grapefruit too, check out this killer bundt cake recipe. - I made some meyer lemon eclairs for Food52 last week. Check them out here. - Thanks for all of your kind words on my last post! make sure to use room temperature egg whites and a very clean bowl and beaters. 1. Whip the egg whites and the cream of tartar on medium speed until the egg whites are quite foamy. Turn the mixer up to high and very slowly add the sugar, about 1 Tablespoon at a time. Whip the egg whites until they are stiff and glossy. 2. Divide the meringue into 6-8 even dollops at least 2 inches apart and with the back of a spoon gently shape them into circles with indentations in the center (to hold all of the yummy filling). Alternately, spread the whole amount of meringue into one large circle about 10-inches wide. 3. Bake the meringue until it is crisp on the outside and set, 60-80 minutes. Turn off the oven and prop the door open, then cool the pavlova completely in the oven completely. 2. Combine the lemon juice, eggs, egg yolk, sugar, and salt in a stainless steel bowl that will rest securely over the water without coming into contact with the water. (Never let the egg yolks and sugar sit together for more than a moment without stirring; the sugar will cook the yolks and turn them granular.) Place the bowl over the saucepan and whisk until the mixture becomes very thick and registers 180° F on a thermometer, about 10 to 12 minutes. 3. Remove the bowl from over the water and let the mixture cool to 140° F, stirring from time to time to release the heat. 4. Meanwhile, cut butter into tablespoon-sized pieces. When the cream is cooled transfer it to a blender and with the blender running, add the butter 1 tablespoon at a time, blending after each addition until incorporated before adding the next piece. The cream will be pale yellow and opaque and quite thick. into the lemon cream and chill until ready to fill the pavlova. Supremed segments of 2-3 pink grapefruit (depending on size) arils from one pomegranate. Stir the lemon cream to loosen. 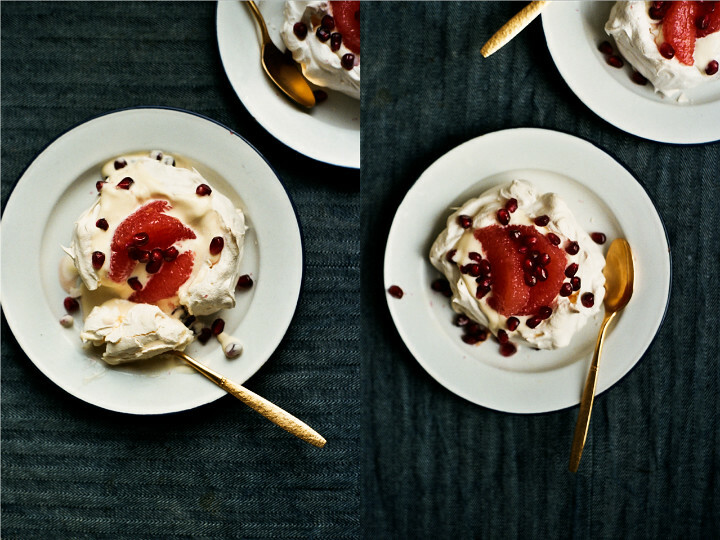 Fill each pavlova with a few generous spoonfuls of cream then top with grapefruit segments and pomegranate arils. Garnish with reserved whipped cream if desired. Enjoy immediately.